So it is logical that many Civilization fans were elated when Sid Meier’s company Firaxis announced that a new Civilization game would be released this year. The American outfit has so far released preview videos highlighting different features of the game (such as the new city districts), as well as the different historical leaders that will appear in this upcoming Civilization instalment, such as Egypt’s Cleopatra or Japan’s Hojo Tokimune. 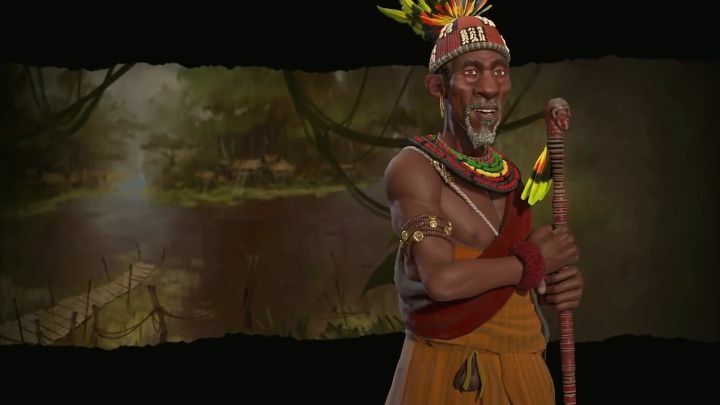 And a recently released preview video focuses on the game’s new civilization, Kongo, and its leader Mvemba a Nzinga. Judging by this video Kongo will be a multifaceted nation in Civilization, as players will be able to win the game in many ways due to Kongo’s flexibility and other advantages. For instance, Kongo gets extra production and gold from ancient relics players can find on the map, meaning it can get an industrial and commercial edge early in the game. Plus the fact that Kongo’s unique city district, the Mbanza, allows Kongo to grow its population faster early on might be a boon to players who want to focus on expansion. Going the military route is also feasible early on due to Kongo’s unique unit, the Ngao Mbeba, who were deployed in Kongo’s military conflicts with Portugal in the 16th century. They are warriors equipped with large shields, receiving bonuses against ranged units and also when fighting in the woods or a rainforest. And those fond of settling these terrain types in a game of Civilization will be delighted to hear that Kongo’s cities can thrive in such terrain, unlike those of other civilizations in the game. All things considered, it looks like Kongo will be an interesting civilization to take command of in Civilization VI, a game that’s increasingly looking like it could be one of the series’ best when it’s released next month.